After nearly four years of drought, Tunisia continues to receive rain this winter. The salt pans are full of water, and they can be seen in this false-color image acquired on March 2, 2003, by the Moderate Resolution Imaging Spectroradiometer (MODIS) aboard NASA´s Terra spacecraft. During the dry season, the salt pans of Tunisia and Algeria contain little or no water. In this false-color image water is blue and black. 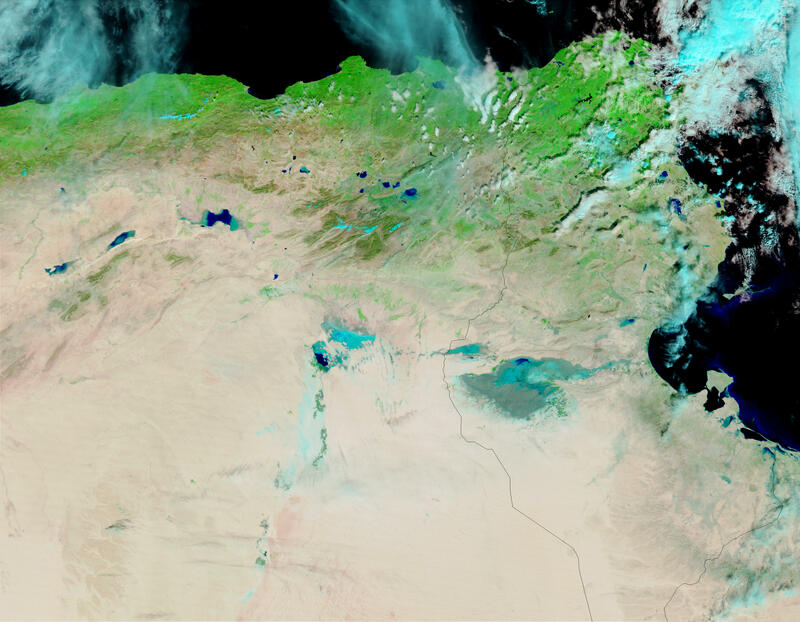 Snow, which has also fallen in abundance in the higher altitudes, appears as a bright cyan and can be seen along the Algeria mountains and ridges. Clouds appear as pale blue and white, and land is green and tan.